When it comes to corporate governance, culture and leadership, it turns out companies around the world have much in common. Whether they hail from Mexico or the U.S. or the BRIC Countries of Brazil, Russia, India and China, organizations driven by trust, shared values, and a “purpose-inspired mission” generate more economic value and social impact. These are the findings of The How Report: New Metrics for a New Reality: Rethinking the Source of Resiliency, Innovation, and Growth, a global study of 36,280 employees from 18 countries commissioned by the consultancy LRN. The HOW Report is based on LRN’s framework of three Archetypes of Governance, Culture and Leadership: Blind Obedience, Informed Acquiescence and Self-Governance. Informed Acquiescence – These organizations “reflect 20th century management practices like hierarchy, structure and control processes.” Managers rely on performance-based incentives, and long-term goals, while important, are often subordinated to short-term pressures. Considering the benefits to customers, employees and shareholders, most companies ought to be striving toward Self-Governance. Yet, it turns out nearly all of the employees surveyed put their companies in the lower performing Informed Acquiescence and Blind Obedience categories. In fact, “only 3% of the 36,280 employees in the study observe high levels of self-governing behavior within their organizations.” The very low share of Self-Governance is highly consistent across all 18 developed and developing countries, as shown in the chart below. The HOW MetricsTM form a system for measuring ten categories of behavior that determine where a company falls in the three Archetypes of Governance, Culture and Leadership (GCLA). The ten behavior indexes that make up the HOW MetricsTM and GCLA are: Significance, Horizon, Collaboration, Information, Trust, Speaking Up, Values, Inspiration, Operational Efficiency and Resiliency. Some of the behavior indexes are more self-explanatory than others. The Significance Index measures, “the extent to which an organization aspires to and pursues making a positive impact on the world versus focusing only on short-term success.” The Horizon Index assesses the extent to which an organization is motivated by a long-term orientation. While leaving plenty of room for improvement, employees rated their companies relatively well on three of the ten indexes: Significance, Operational Efficiency and Resiliency. Yet, in each case, no more than one-third of employees rated their companies High, while roughly another third of employees gave their companies Low ratings on these measures. For the remaining seven categories, just 15 percent or less of the employees surveyed rated their organizations High, with two-thirds or more rating them Low. The chart below shows the overall ratings for each index for the 18 countries and 36,280 employees. The behaviors exhibited by companies have similar patterns across countries. Consistent with the overall results above, employees rate their organizations higher on Significance, Operational Efficiency and Resiliency than other behavior indexes. Horizon, Speaking Up, and Inspiration generally receive low ratings regardless of geography. Still, there are noticeable differences in certain behaviors from one country to another. For example, employees in India and Mexico rate their organizations relatively high on the Collaboration Index. Employees in Germany and Japan, two of the world’s largest and most advanced economies, rate their companies relatively low across all behaviors. On the other hand, the reliability of country comparisons on specific behavior indexes could be affected by cultural factors rather than real organizational differences. For example, employees in certain countries like Germany and Japan may rate their organizations more conservatively than others. The clever acronym TRIP is used to explain the relationship between trust, employee engagement and company performance. Organizations that create an environment of trust enable employees to take risks. Risk-taking and experimentation are key factors in innovation. Companies that innovate perform better and have an advantage over their competitors. 6x more likely to report stronger financial performance than the competition. Moreover, high levels of trust, shared values and a purpose-inspired mission have a “cascading effect” that leads to higher levels of the other seven organizational behaviors. 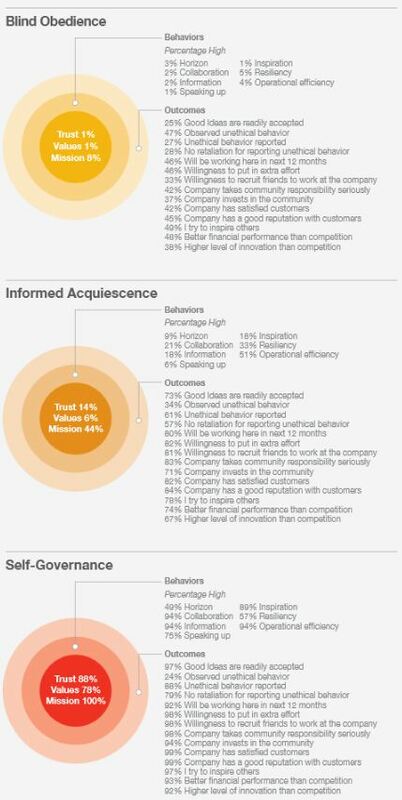 The charts below show the extent to which Trust, Values and Mission are associated with each type of organization and contribute to higher levels of other behaviors and outcomes that lead to superior performance and competitive advantage. Employees in Self-Governing organizations are more likely to observe higher levels of customer satisfaction and to report their companies enjoy good reputations among their customers. Fully 99 percent of employees of Self-Governing organizations indicated their company has very satisfied customers, as shown in the chart below. For Informed Acquiescence and Blind Obedience, the corresponding figures drop to 82 percent and 42 percent, respectively. Self-Governing companies understand that motivated, engaged employees are the key to their financial performance and long-run success. Engaged employees can be some of a company’s most valuable brand evangelists, influencers and recruiters. They contribute more ideas, are more productive and reduce the high costs of hiring and firing. The core behaviors of self-governing organizations – Trust, Values and Mission – lead to highly engaged employees. The more engaged employees are, the more they exhibit nine engagement traits that contribute to higher customer and employee satisfaction and better financial performance. 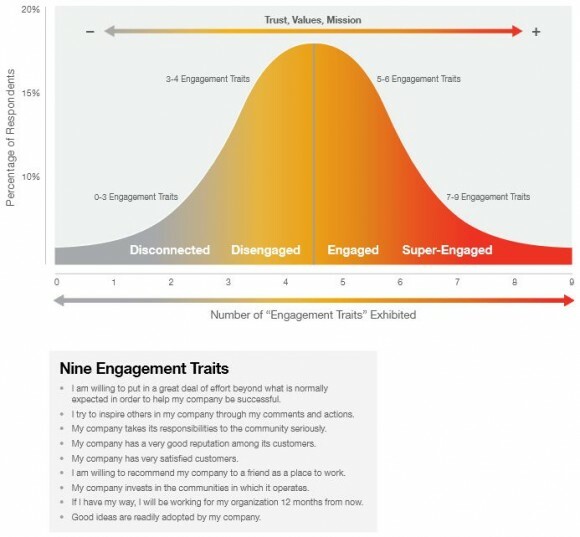 The bell curve below shows the positive relationship between levels of Trust, Values and Mission, employee engagement and the number of engagement traits exhibited by employees. The chart below shows how companies that achieve high levels of Self-Governance have more loyal employees who are more likely to recommend their employers to friends. If Self-Governance is So Good, HOW to Get More of It? An old adage goes that the first step in fixing a problem is recognizing one exists in the first place. The HOW Report finds employees are far more aware of the lack of self-governing behaviors than those with the power to do something about it. 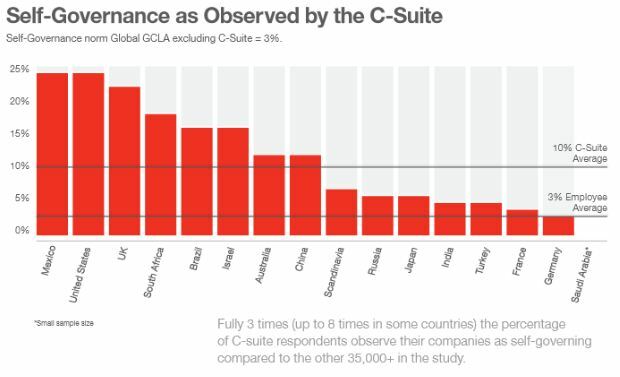 The chart below shows the gap in the level of Self-Governance observed by the C-Suite and employees across the 18 countries in the study. When it comes to Trust and Inspiration, CEOs and C-Suite executives are more than twice as likely as their employees to rate their companies’ performance as High or Medium. Once the problem is recognized, the next step involves doing something about it. The transition to Self-Governance involves a good deal of hard work and sacrifice. While the route from Blind Obedience to Informed Acquiescence is relatively well-marked, the transformation from Informed Acquiescence to Self-Governance presents a number of challenges. The short-term obstacles and steep learning curve depicted in the chart below suggest that several of the key characteristics of Self-Governance are both means and ends, namely the long-term perspective and mission-driven determination to reach the journey’s destination. Visit the Global Sherpa home page.